A Barnsley Historian's View: Why Do I Research First World War Soldiers' Stories? Why Do I Research First World War Soldiers' Stories? Since this time last year I have been deeply involved with the Barnsley War Memorials Project however my interest in the First World War and the experiences of the men and their families goes back a lot further. I have been researching my family history since 1992 but at that time there were very few easily accessible resources available for the First World War. It is hard to remember what it was like without online searchable databases, but 20 years ago most research was done from microfiche and film, transcriptions and original records on site in local Record Offices and Archives. For me the major breakthrough was the Army Service (and Pension) Records coming online on the Ancestry website in 2007, when it became so much easier to research soldiers if your man's records were in the 40% of the burnt records (the majority of the Service Records were destroyed in the blitz in WW2) that survived. Medal Index Cards had been available from the Public Record Office online from shortly before that - but at a cost (unless you were actually in the Public Record Office in Kew) and of little use if your man had a common name (these are now also on Ancestry). 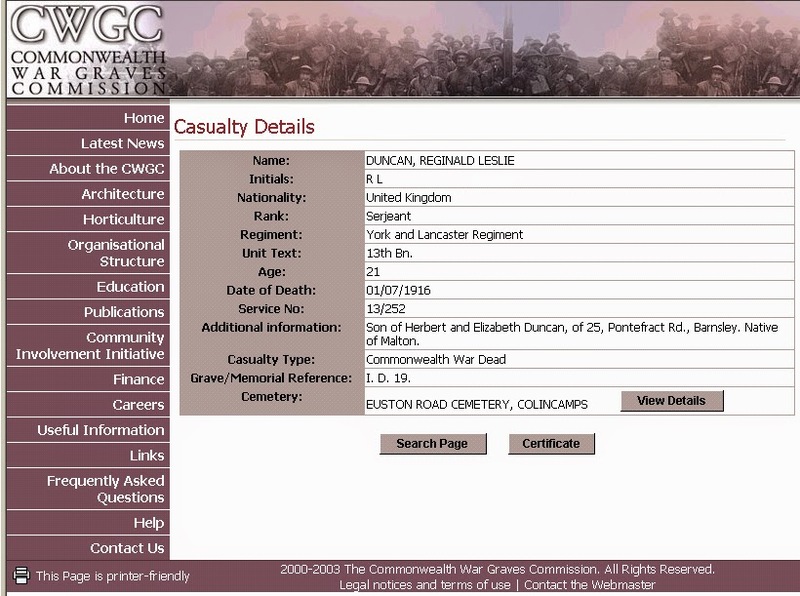 I appear to have started saving images of soldiers' entries from the Commonwealth War Graves Commission website in 2008. So much has changed over the past seven years! Even the CWGC pages use to be a snazzy overall purple colour quite unlike the cool grey and striking red and green of today. I discovered that a large number of the OH's relatives were involved in the war. My own family tree is less well populated by soldiers - I suppose that is the contrast between his family in urban, industrialised Barnsley and my North-Eastern families many of whom came from predominantly rural areas, with a bit of coal mining on one side or from coastal towns concerned with sailing and ship building on the other. 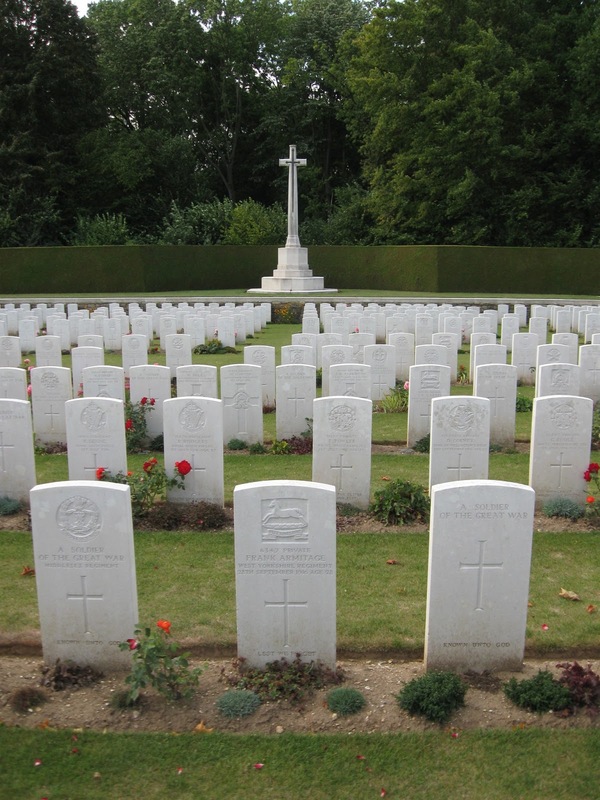 By the time the OH and I travelled to Belgium in 2009 to visit the battlefield cemeteries with Leger Travel I had already researched enough of our WW1 soldiers to print out a page full of names and references to check should we go to the correct memorials and cemeteries. I gave a talk to the Friends of Barnsley Archives in March 2013 based on three of the OH's relatives' experiences of WW1 using photos we had taken in 2009 of Tyne Cot, the Menin Gate and the Connaught Cemetery near Thiepval where Frank Armitage is buried. My interest has been expressed on this blog by a series of First World War Soldier Stories beginning in April 2013 with Frank (see the eponymous tab above for links to all the stories) and from July 2013 was directed into Barnsley War Memorials after a request for another talk for the Friends of Barnsley Archives to be given in November 2014. As 2014 would be the first year of the Centenary of the First World War a talk booked for November had to be about the war and as the date of the booking would fall the 10th of the month it seemed appropriate to try to pull together sufficient information on local memorials to reflect the concentration on Remembrance which we were sure would pervade by then. A fellow historian got to know about my interest in WW1 War Memorials and I was asked to attend a meeting to discuss the possibility of some kind of group to collate a Roll of Honour of Barnsley's WW1 Fallen. In the course of each of our own research paths we had both discovered that Barnsley Council had not produced a list of names of the Fallen after WW1, unlike many other towns and cities across Great Britain. Sheffield has a Roll of Honour kept in the Town Hall, and I had used a transcription of it in my research into my first husband's family history in the 1990s. Fortunately there aren't many Tom Appleby Dunbars in the world as the list only gives very brief details, name, number, rank and regiment. Incidentally this list can now be consulted online at the Sheffield Soldiers of the Great War website. The lack of a similar memorial in Barnsley seemed slightly shocking, but surely something that could be relatively easily amended. Ah, the innocence of those early discussions! The Barnsley War Memorials Project was formally constituted in March of 2014 with a committee of Chair, Treasurer, Secretary and Information Officer, later co-opting a Council Liaison Officer when it became apparent that this would be helpful. As the lady who had called the original meeting was keen to pursue her own research projects she is not a part of the constituted Project, however she continues to submit research to Barnsley Archives on an independent basis. She recently presented two folders of research about the men named on the Barnsley Holgate Grammar School Old Boys WW1 Memorial Plaque (now on display in the Cooper Art Gallery) to the Archives. The Barnsley War Memorials Project now has a website, created using Blogger software, just like this blog, but now fronted by a dedicated domain name www.barnsleywarmemorials.org.uk which appears to give it a little more credibility with organisations and individuals who look down upon 'blogs'! We also have a Facebook page and a Twitter account. I have had to do a bit of up-skilling to learn to manage these various forms of social media - but in my opinion you need to use every available option to publicise a project, from newspaper articles to tweets! My regular duties as Secretary include answering emails, creating web pages for individual war memorials, creating Barnsley Soldiers Remembered webpages from information submitted by family members of soldiers from the Barnsley area, and writing and distributing a monthly digital newsletter. There are now eight issues all available to download from the Newsletters tab on our website. I also post on the Facebook page and regularly Tweet to pass on our updates and to generally make people more aware of the work of the Project. I have been well booked for talks in 2014. I spoke to a conference in Leicester about the ins and outs of WW1 research; I have spoken to the Friends of Darfield Churchyard on some of the men on their memorials and to the ladies of Holmfirth Womens Institute on Families in World War One. My talk on "Who Wanted War Memorials?" was well received in November and can be seen in two parts on YouTube and I have since given a talk on the Barnsley War Memorials Project itself raising some useful petty cash for our Project. I also gave short talks on the First World War to two primary schools in the Cudworth area in November and hope to be invited back next year. I took part in the launch of the South Yorkshire Through Time webhub at Experience Barnsley by giving a brief talk on the progress of the Barnsley War Memorials Project and explaining how we use social media to connect with the public. I enjoy researching other people's Soldier Stories and in the past year through them have discovered a wealth of other resources that could be applied to my own family history. Some of these are featured in the most recent edition of the newsletter (see left), Almanacs, local newspapers, community websites, Absent Voters Lists. Others that I can think of are the wealth of books on the subject of War Memorials and the First World War that are available - Barnsley Pals by Jon Cooksey is particularly useful (and Pen & Sword, the military book publishers are based in Barnsley) but I have also enjoyed more general books like Memorials of the Great War in Britain by Alex King (looking at the symbolism and politics of Remembrance), The Origins of the First World War by Annika Mombauer (the title says it all! ), Empires of the Dead by David Crane (the story of Fabian Ware the man behind the CWGC) and most recently A Kingdom United by Catriona Pennell (which looks at popular responses to the outbreak of the First World War). I am also more aware of the growing number of local websites around the country created by groups carrying out their own research into War Memorials and the Great War. I particularly like the Tynemouth World War One Commemoration Project as they have been working for some years now and have lots of ideas that we would love to 'borrow'. One is a map of the local area with spots to indicate where each Fallen man had lived - they do a great Powerpoint presentation which shows these maps and spots changing over the period of the war. They also recently featured on a BBC television programme. Brilliant! There are also a host of books produced by these local groups and organisations who are researching the history of their own area during WW1. 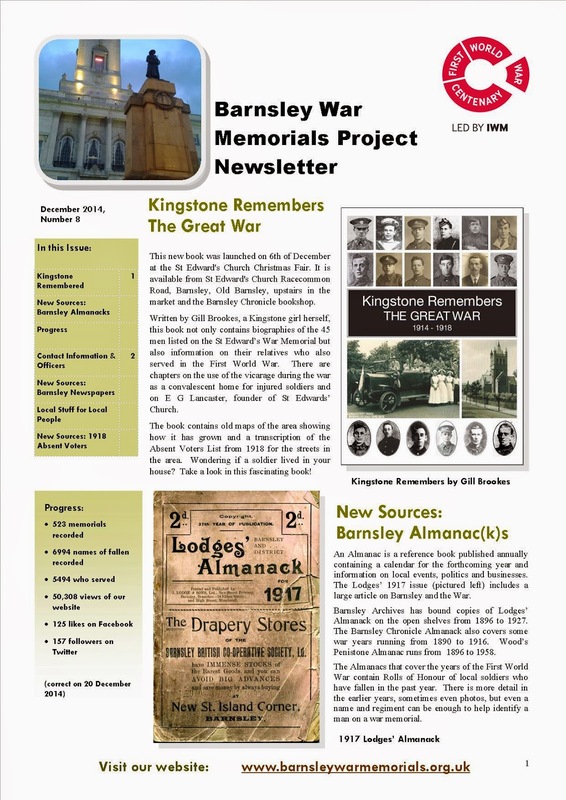 Most recently Kingstone Remembered (as seen in the December newsletter above) but also see Royston and District in the Great War (which I wrote about last year) and Lest Cudworth Forgets written in 2004 by the Cudworth History and Heritage Group. This year there have also been two books from the Penistone History Group, one about the men on the Penistone War Memorial and one about the men from Thurlstone and Hoylandswaine. There has been a booklet from the Billingley Village History Group on the men from their village who fought, fell and returned home (see issue 4 of the BWMP newsletter for details) and a book from the Worsbrough History Group on the names on the Worsbrough Dale War Memorial at St Thomas' Church. This means that the experience of assisting with a large borough wide project has given me additional insights into co-operating with other local groups, improving my own research and widened my understanding of the background, politics and social history of the First World War - which is not a bad thing! So, why do I Research First World War Soldiers' Stories? Because I find them fascinating slices of early 20th century social history - because they intertwine with the wider history of this country and the rest of Europe - because many of my own ancestors were touched by the issues that I am now coming to more fully understand and appreciate. Because they are relevant to everyone, young and old, that's why! Thank you for reading - and please visit the Barnsley War Memorials Project website, have a look at the huge list (500+) of memorials we have discovered in the past year, view some of our photos and search the site for your own family names, then maybe take a side step and and read some of the Barnsley Soldiers Remembered stories linked to the memorials which can be found on the companion site.